What is the Consignment Sale? Voted one of the Top 5 Consignment Sales in the State by Boston Parents Paper, the LexFUN! consignment sale is one of the largest children’s and maternity consignment sales in the area! Hundreds of buyers and sellers are brought together under one roof for a fantastic one-day event offering thousands of gently used, high quality baby and children’s clothes (newborn to size 12), gear and toys at very reasonable prices! Recently, maternity clothes are also available at the Sale! Half of the proceeds of sold items are earned by the sellers and the other half goes to the LexFUND! Preschool Scholarship Fund, which funds preschool scholarships for families who need the financial help. Items that are not sold are donated to charities that need these items such as Cradles to Crayons, Big Brother Big Sister Foundation and More Than Words. At the April 2018 Consignment Sale, sales hit an all-time high of $76,000. Half of the proceeds were donated to our LexFUND! Pre-School Scholarship Fund, providing opportunities for children of families with financial need to get quality early education to support their child’s lifelong learning. Scholarships range from $250 to $4,000. Since our scholarship fund was founded, LexFUN! has awarded over $300,000 to local families! Find out more. 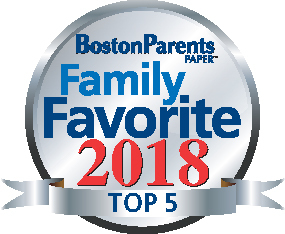 We are delighted to have once again earned a top spot in Boston Parents Paper Best Family Favorites 2018 as one of the Top 5 Consignment events in the state.